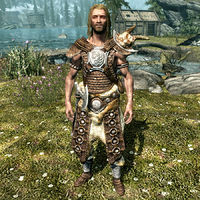 Hern is a Nord lumberjack who owns and operates the Half-Moon Mill with his wife, Hert. He is one of the targets of the Dark Brotherhood, and will not appear until the quest to kill him is started. Hern wakes up at 8am and immediately heads to the mill to work until 7pm, only having a small break to eat at 6pm. The remaining hours of the day he will spend just wandering around the mill until midnight, when he will have a last meal before going to bed. 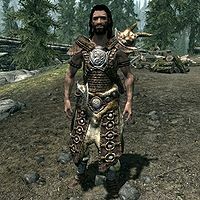 He wears a set of scaled horn armor with matching boots. He also carries a steel war axe, a key to the millhouse and a selection of lower-class items and gold. Once you've received your orders to kill him, you may ask Nazir about him. He will reveal that both Hern and Hert are actually vampires, "He's a vampire, and has blended into human society for years. He's never far from his female companion, Hert. Also a vampire. The contract is for the male, Hern. But you'll probably have to contend with the female, too. So for Sithis' sake, watch yourself." Like with most targets of the Dark Brotherhood, you may also have a word with Hern before killing him. When you approach him, he will greet you very eerily with the words, "Well now. What have we here? A lost little lamb?" and you can reply in three ways. If you walk away instead, approaching him again will have him warn you "You really don't want to be loitering here, stranger." "Hmph. Don't say much, but there's a strange aura about you. You walk in the shadow of death... Leave here. Leave here and never return." "Assassin versus vampire. A fight for the ages." "Ah, so the Brotherhood has come for old Hern, has it? Well then, let us meet as equals." "I know what you are, nightspawn." "Well then, you won't be leaving here alive!" With the Dawnguard add-on installed, Hern's appearance changes, making his condition even more clear than before. Even though Hern is a vampire himself, he will still become hostile towards you if you are a blood-starved vampire. Hern was supposed to have some eerie greetings similar to his wife if you talked to him outside the related quest. However, since he only spawns during the quest, this dialogue will never be heard: "Oh my, a guest! ", "Please, make yourself at home!" , "Lone travelers can find these woods a little treacherous." and "We've been looking for someone to join us in a hunt." Hern never loads any wood in the saw while working, he just stands in place. Hern never sleeps because the only available bed is incorrectly owned by RiverwoodSvensHouseFaction.